I know eww but hear me out, with the warmer weather arriving in the UK most of us will be wanting to expose a little more skin. Oddly I seem to get more blemishes on my back and shoulders than on my face which in the cooler weather are easily but come the Summer it is all hands on deck - panic stations! When I was a little younger I went to the doctors and asked for a little help (as you do) and was given antibiotics - great. I have nothing against antibiotics but don't deem them to be necessary for blemishes on my back? The older I have became the more I try and research a more natural approach and for pesky spots the two recommendations that crop up time and time again are Witch Hazel and Tea Tree oil. Now don't get me wrong you could easily dab either oil on said spots daily and I guess they would eventually clear up but I wanted something a little more convenient, not oil stains on my clothing. Enter Australian Bodycare Tea Tree Oil Skin Wash. This wash contains natural Tea Tree Oil within a pH balanced body wash so it doesn't further upset the skin's balance. Due to the Tea Tree addition it is naturally antiseptic so it prevents any of the blemishes from not only spreading but also encourages them to heal quicker too. 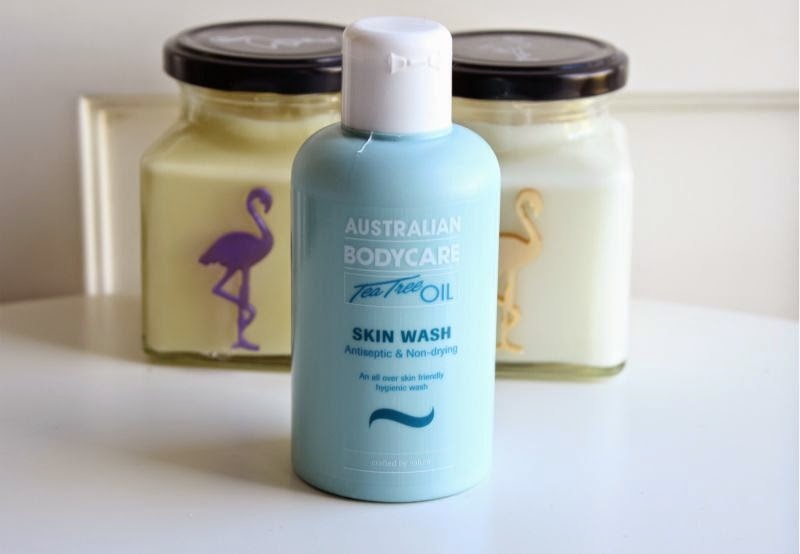 The wonderful thing about the Australian Bodycare Tea Tree Oil Skin Wash is that it dries out the problem areas but not the rest of your skin - the blemishes shrivel up and disappear yet your skin is left perfectly balanced. Clever huh? I like that I can quickly treat my bacne in the shower with next to no effort daily. Admittedly it is not the best smelling body wash out there but for a blemish free back it is a price I am willing to pay. Australian Bodycare Tea Tree Oil Skin Wash £12.50/250ml via John Lewis - link. I have the smaller 150ml bottle which I can not find online.